I am happy biometric..addhar link with my bank account and sim ..etc. Google.. Facebook.. what's know everything about me .. except biometric . I feel secure with Addhar link . Aadhar has two kinds of information. One is demographic and biometric. As such we give demographic info to others when we submit a Xerox copy of aadhar as well as to register our names with any social site. But there isn't a single incident that biometric info is hacked or copied. 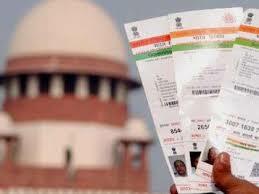 Aadhar is an important tool for ease to governance eg census data etc. A law abiding citizen shouldn't be worried about aadaar card.